All the world’s a stage, especially at The Globe. For some 500 years, London has been a thriving hotbed of theatre, filling the playhouses with the work of playwrights new and old. In terms of sheer spectacle though, nowhere can best The Globe, the stunning replica of an Elizabethan playhouse that premiered many of Shakespeare’s best-loved works. Famed for their outdoor performances of The Bard’s classics, an evening at The Globe is a theatrical experience like no other. Here’s all you need to know! We’ll clear up one misconception straight away: Shakespeare never actually set foot in The Globe, despite it often being referred to as ‘Shakespeare’s Globe’. The Globe is a meticulously constructed replica of the original Globe Theatre, which opened in 1599 on a site a few hundred metres away from its modern equivalent. The original theatre had a colourful history; constructed from the timbers of The Curtain (London’s second ever theatre), it was set on fire by an errant cannon during a production of Henry VIII in 1613, rebuilt the following year, and eventually torn down by the notoriously fun-averse Puritans in 1644. The modern version was the vision of legendary American actor and director Sam Wanamaker, who spent some 23 years researching, designing, and fundraising for the project. Sadly, he never saw it finished; work on The Globe was completed in 1997, some three and a half years after Wanamaker’s death. To commemorate his work, one of The Globe’s two theatres bears his name – the Sam Wanamaker Playhouse is a candlelit space inspired by the indoor playhouses of Jacobean London. The other theatre is the Globe Theatre, the circular outdoor theatre which draws most of the attention, and plays host to productions from April to October (the Wanamaker Playhouse hosts winter shows between November and April). Together, the two spaces offer a programme of theatre determined by the Globe’s artistic director, a post occupied by such luminaries as Oscar-winning actor Mark Rylance. The current artistic director, Michelle Terry, has a plain-stated intention to modernise The Globe’s output, by using methods include directorless, actor-led productions, genderblind casting, and a strong commitment to diversity – which means these plays are unlike any Shakespeare you’ve seen before. Productions run throughout the year, and unsurprisingly tend to ramp up in the summer – this year, the summer season begins on April 23rd (don’t worry, we’ll get to the upcoming shows shortly). The Globe really do go above and beyond in trying to accommodate all kinds of theatregoers – not only do they offer British Sign Language performances and captioned performances for the deaf or hard of hearing, but they also run audio-described shows for those with declining sight, and relaxed performances for those with autism, learning disorders, or sensory and communication disabilities. Which really is jolly decent of them. 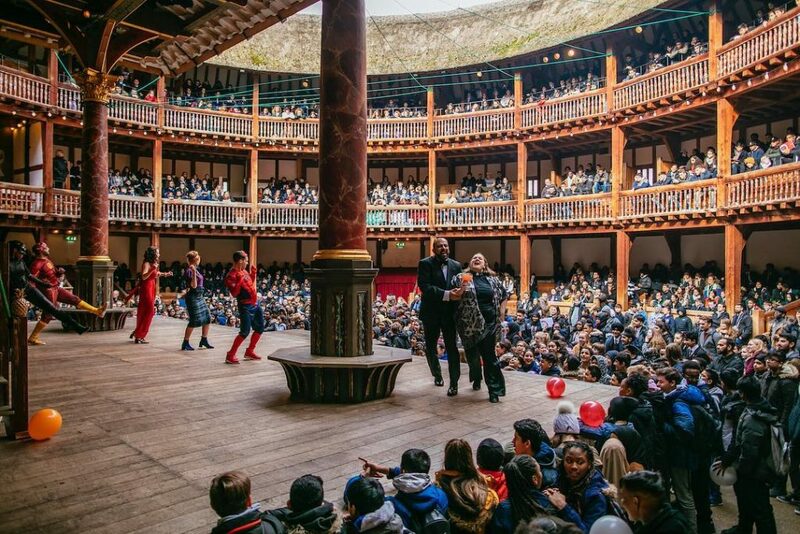 If you’re not here for a play, you can undertake a guided tour of The Globe, tracing the history of the theatre through a series of colourful stories. The theatre also offers a wide range of talks, including a fascinating Ask The Actor series, special events, poetry nights, and workshops. Back in the realm of the theatrical, The Globe’s ‘Read Not Dead‘ series gives actors one morning to rehearse a forgotten play, and then perform it in the afternoon in a laidback setting. You can’t really limit good theatre to a certain time, but as I’ve mentioned, the summer season is possibly the best time to visit. Watching live theatre in the summer sunshine (hopefully), standing in the yard just as audiences would have in Shakespeare’s day, is honestly an experience every London resident and visitor should have. Plus, at only £5 for a standing ticket, trips to The Globe certainly aren’t going to break the bank. The Globe normally run a few special events around Shakespeare’s birthday (widely accepted to be April 23), including their long-running Shakespeare Walks. On April 21st & 22nd, you can embark upon a two-hour tour of Shakespeare’s London, brought to life by a company of twenty-two actors, and ending up at The Globe. One new addition during Michelle Terry’s reign is the intriguing Audience Choice. For five performances of the Touring Ensemble’s season, you’ll walk into The Globe without knowing which play you’ll be seeing. As the ensemble are performing Twelfth Night, The Comedy Of Errors, and Pericles all summer, they’re well-versed in each – so on Audience Choice nights, the audience decides which play the actors will be performing, via the highly scientific method of ‘loudest cheer wins’. Terrifying for them, but good fun for you!